UK Windcats have designed a prototype of a wind turbine and grain drying system. Video by Jeff Franklin, UK Ag Communications. 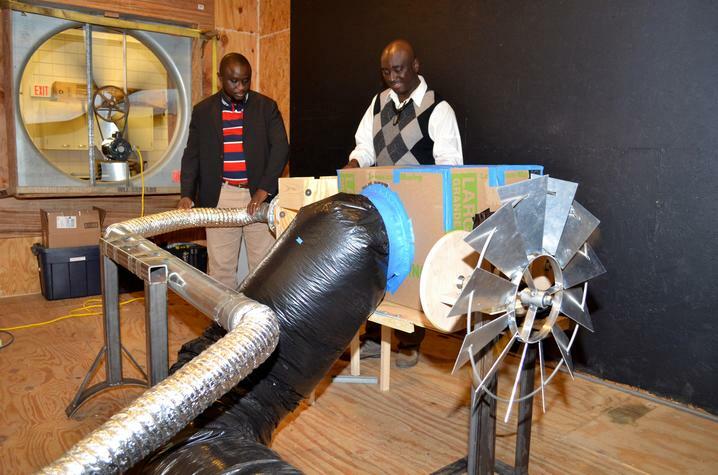 LEXINGTON, Ky. (April 6, 2018) — A wind-powered grain drying system developed by students in the University of Kentucky College of Agriculture, Food and Environment could improve grain quality and people’s health in sub-Saharan Africa. The student team, the UK Windcats, designed a prototype of a wind turbine and grain drying system with funds they received from the U.S. Environmental Protection Agency’s P3 — People, Prosperity and the Planet — Program. This program is a student design competition focused on creating innovative and sustainable solutions to real-world environmental and public challenges. They will display their prototype with the other 30 P3 recipients this weekend in Washington, D.C. Currently, sub-Saharan grain producers, most of who are subsistence farmers, dry corn outside in very hot and very humid weather. These conditions create a perfect atmosphere for mold growth including molds from the Aspergillus family. These types of mold produce aflatoxins, which are poisonous carcinogens that have numerous negative health and monetary impacts. Aflatoxin contamination is a huge issue in Africa. The turbine is powered by the average sustained wind speed and can help producers quickly dry the grain, reducing the potential for mold growth and aflatoxin contamination. Poverty and limited resources are challenges in sub-Saharan Africa, so the UK students developed an inexpensive system that allows farmers to build the turbine with durable resources readily available to them. “We are quite convinced that the design we have has the potential to be a solution to the problems of aeration in drying of grain, and I also think that from all we have seen so far it might be able to solve drying issues even beyond grains,” said Francis Agbali, UK doctoral student and the Windcats’ leading member. The project is an opportunity for both Adedeji and Agbali to positively impact their native country of Nigeria, a sub-Saharan country. “It is one time in my career that I have the opportunity to be related to something that is not just for the shelf, but has the potential of saving lives and the potential for addressing a real-life situation,” Agbali said. In addition to Agbali, UK students on the project included John Jerrod Mays, Chase Mahoney and David Cline. William Adams, UK senior engineer associate, also contributed to the project. Akinbode Adedeji (left) and Francis Agbali look over the wind turbine and grain drying system. Photo by Katie Pratt, UK Ag Communications.